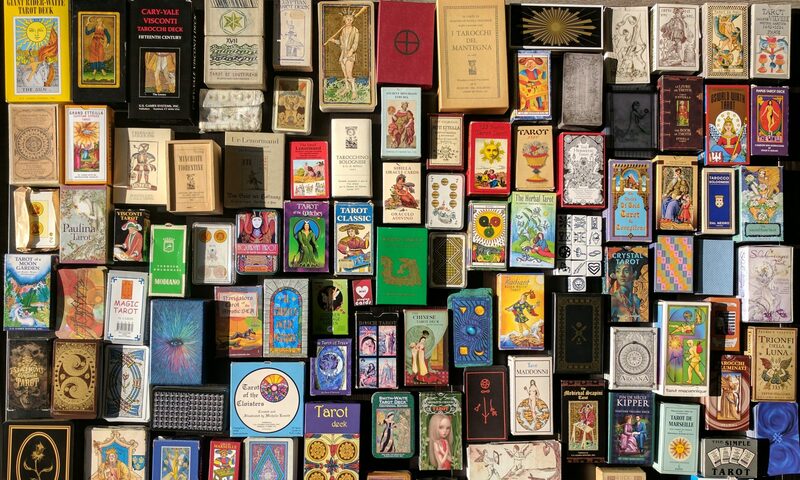 One of the questions I’m asked most often about my tarot collection is where I get my decks from and how I find new ones to buy. The answer isn’t terribly exciting really. I buy most of my decks from Amazon and eBay, but I have got a few from other places as well. On Amazon, you can easily find mass market decks including historical, traditional and modern styles. Mass produced decks are generally under £30 and usually in stock on Amazon. It’s easy to find similar decks on eBay as well, but eBay is also a great place to get out of print decks that aren’t in stock on Amazon. In fact, when Amazon do have out of print decks in stock, they’re often very expensive, and it’s easy to find a cheaper copy on eBay, especially if you don’t mind getting a used deck. Having said that, I’ve found a few new and sealed decks on eBay for great prices too. Checking the sold prices on eBay is a good way to check how much you can expect to pay for a deck that’s out of print. Another great way to pick up decks on eBay is to buy a collection or bundle. They don’t appear very often, but when they do, they’re usually really good deals. I once won an auction for a collection of over 20 decks including some limited edition hand made decks, and I paid significantly less than if I had bought the decks separately. Again, it’s worth checking out the values of the decks by looking on Amazon or at sold listings so you know how much they usually sell for. I have also bought independently produced decks directly from the creator’s website, or through marketplace sites like Etsy. Sometimes this is the only place a deck is available. I usually find decks like this via Instagram or Youtube reviews by people I subscribe to, and they generally include the information about where to buy a deck. If not, you can Google it. Instagram and Youtube are my favourite places to go when I’m looking for inspiration for my tarot wishlist or more information about a deck I’ve seen somewhere and might be interested in acquiring. On Youtube you can find people unboxing a deck for the first time, showing cards from a deck or doing a full, in depth review of the artwork and symbolism in a deck. On Instagram, people share photos of readings, daily card draws and so on, and I’ve come across quite a few decks for the first time when browsing there. Another place I go to find decks I like is Aeclectic Tarot. You can browse decks by style or theme and see example cards from thousands of decks. Each deck listed includes information about where you can buy the deck. 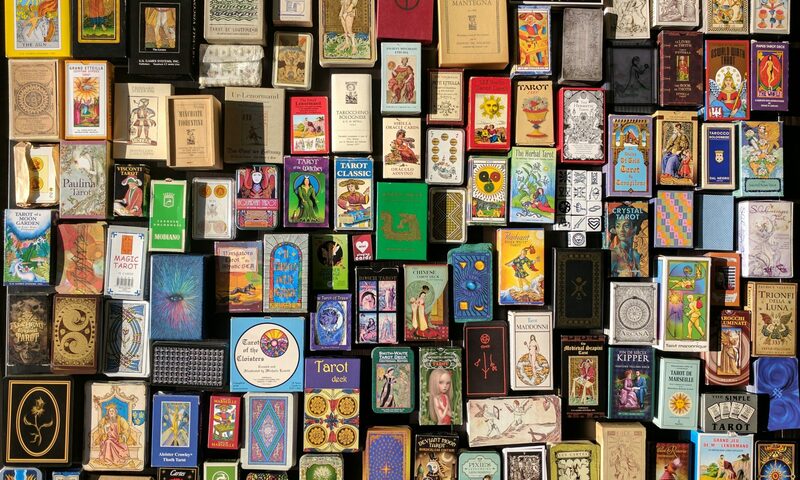 There are a few specialist tarot stores online that stock hard to find, limited edition, out of print or independently produced decks, and I’ll include some that I’ve browsed here for completeness, but I haven’t shopped at any of them (yet). They are, in no particular order: Tarotbg, Little Red Tarot, Alida and CollecTarot. I’ve also bought tarot decks in physical stores. In the UK, where I live, Waterstones sometimes have a few decks, although they often only have the Original Rider Waite in stock. W H Smith also sometimes have this deck but they mostly carry Doreen Virtue decks that I have no interest in. Pagan, witchy or new age shops generally have a better selection, so they’re a good place to look. Some of these independent shops also have online stores. Finally, another place I find decks to buy is through recommendations from friends and people I meet in my local pagan community. People show me their decks, or tell me about decks they’ve come across that they think I might like. Sometimes they’re way off the mark or mention decks I’m already familiar with, but other times they introduce me to a deck I might not have come across otherwise that makes it onto my wishlist or into my collection.